This looks interesting. Pls keep us updated if any more progress on this. I'm also interested buy not too sure If I can DIY led. Has anyone tried this? 10W Floodlights. They claim the white color is 6000K. Quite cheap. Tempted to try. Recently converted my 6X2X2.5 to planted but still running on 5ft T5 54WX4. The big plants cannot jalan . Need to check on the quality of the product. What kind of setup you are using? Hood? u need to take very caution on the heating issue, is the heat dissipation is not done properly, the LED will burn out very fast. LED lighting main problem is the driver. Quality of the driver is very important. And at that price, you might want to consider again. I was thinking to make a frame to mount a few of these lights. Not sure about heating issue, this is actually an outdoor fixture. I've seen it at some lighting shops and hardware stores. 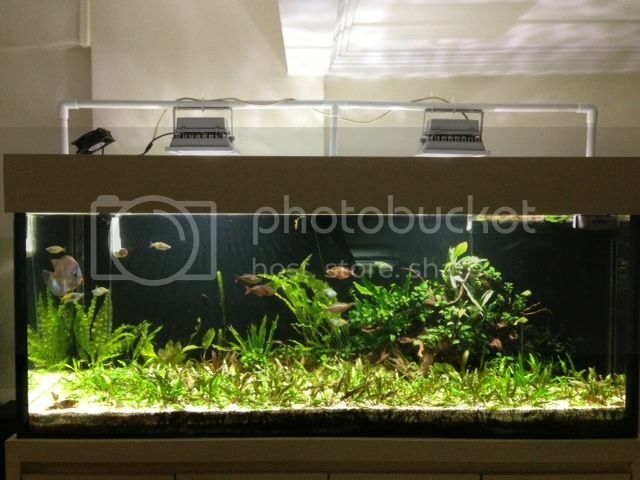 You can build a stainless steel frame to mount the floodlight directly over the tank/FGT. 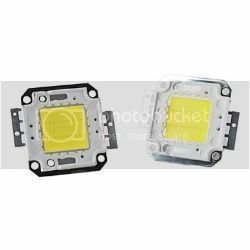 Make sure the floodlight you are getting is IP65 of good quality. I have seen floodlight with IP65 with water in it, the LED chip and driver are gone case. A 30W floodlight should be sufficient since you are using it at about 2-3m height. It is about >3000 lm and >200lx at 120 degree angle. I bought the 30W floodlights from Choo Chiang Marketing. Not happy with the ugly PVC pipe frame and wiring (My handiwork). $20 down the drain . Noticed no reflection as compared to T5, a little worried for the shaded plants. love the ripple effect. Will be looking out for aluminium bars to diy a frame again. Stay tuned for MK II and how the plants fair!